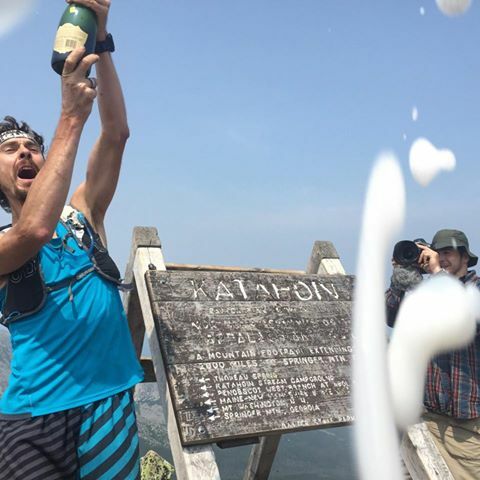 Of course we all know that Scott Jurek completed his thru-hike of the Appalachian Trail yesterday in record time – he now owns the FKT (fastest known time). He completed 2,160 miles in 46 days, 8 hours and 8 minutes. Incredible! The finals days had been described as “a nail biter” and people said they were “at the edge of my seat” as they tracked his journey. I also saw plenty of “I don’t think he’s going to make it” and “there’s no way he can make it.” Psshhh. For those of us who followed Scott Jurek prior to this epic adventure we knew that when the going gets tough, that is when Scott shines. There was no way he was not going to break the record. There is a lot we can learn from him – from his mental toughness and never-give-up attitude to his strong determination to chase his dream. I hope that everyone is inspired to set their own goal and work like crazy to achieve it. He is an amazing athlete with a race resume that cannot be touched. Congrats Scott! Thank you Strongest Hearts for spending time with us and for showing the world what vegan athletes are capable of. Today starts week 2 of my build to Powerman Zofingen in September and I couldn’t feel better – both mentally and physically. Mentally it’s great to be focusing on one race again. Racing American Zofingen long course, Cayuga Trails 50 miler, Eagleman Ironman 70.3, and Vegan Power 50k back-to-back was challenging and exciting, but also tough in more ways than one. I enjoyed the challenge of trying to figure out how to mesh my training for these different events, and I enjoyed the process of trying to recover and switch gears completely in a short amount of time. It was definitely a learning experience and most of all I loved proving to myself that I could handle it. However the result was that I went into each race not in top form as I wasn’t able to train solely for any of them. My mileage going into the 50 miler was nowhere near what it should have been. While working a full-time job there was no way to hit the mileage needed to be competitive in that field when I had to work on hitting the minimum volume I needed on the bike as well. I relied on my bike training to make up for the lack of running mileage but it cannot replace the time on your feet. The result was that I held 2nd place for 33 miles before barely hanging on to 4th to finish. At Eagleman my swim was horrendous, and while this was nothing new for me I don’t want to even admit how little swim training I did before the race. When swimming was the smallest portion of all of the racing I was doing, it definitely got pushed aside…a lot. By the time I got to the 50 k I knew that I would be fine volume-wise but I think what drained me the most was racing in crazy heat at Eagleman only 6 days prior. I was happy to be finished and onto a 2 week break with minimal training. And now I am happy to be following a strict plan leading up to Powerman Zofingen. I thrive on regimented training and without having to juggle, second-guess, make changes on the fly I can simply put my head down and do what I do best – train! I have 2 trail races coming up in the next 2 weekends but they will be more for fun. I am 100% working towards Switzerland now – a bucket list race for me and a World Championship. I feel recharged and ready to go! I hope everyone else is having a great season of training and racing with some goals to look forward to! This entry was posted in Strong Hearts Vegan Power and tagged #FKT, Appalachian Trail, Eat and Run, Georgia to Maine, Powerman Zofingen, Ragnar, Ragnar Cape Cod, relay racing, running, Scott Jurek, Strong Hearts Vegan Power, Strongest Hearts, vegan, Vegan Power by lljkline. Bookmark the permalink.